Hello! Today I have a card using the Taylored Expressions June Stamp of the Month, You Make Me Happy. This set is a perfect match with June Key Ingredients, but it also can be used with other patterned papers. I used the Echo Park Bundle of Joy Girl collection. This card is for Sabrina's support coordinator, who is expecting a baby girl! I stamped the umbrella image twice (once on a piece of Choice Snow White cardstock and again on the pink chevron patterned paper). I could have used the coordinating dies, Rainy Days, but instead I opted to hand cut the umbrella in one piece. Note that the umbrella die cuts this into 3 pieces, perfect for a multi-colored umbrella. I used Jen's Deconstructed Sketch #106 for my layout. For more information about the Stamp of the Month, Key Ingredients and Deluxe Subscription (includes SOTM and Key Ingredients, please visit the subscriptions page on the TE website HERE. 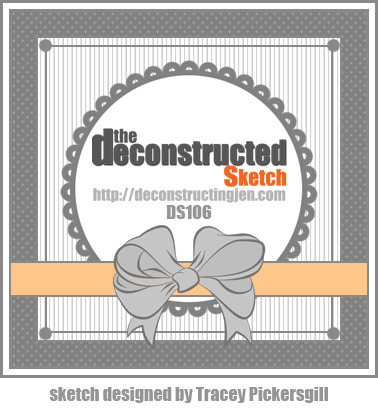 Accessories: Taylored Dies: Chevron Border Dies, Banner Stacklets 1 (Taylored Expressions); Standard Circle Nestabilities - SM (Spellbinders), Markers (Copic), Pearls (Queen & Co), Button, Hemp cord, Foam tape, Thread, Sewing machine. This is gorgeous Stephanie! I love the pop of pink cardstock behind your fantastic designer papers and that's super cute umbrella! FUN card! SO cute Steph! LOVE the papers and the button on the handle of the umbrella! Such a sweet card Stephanie! 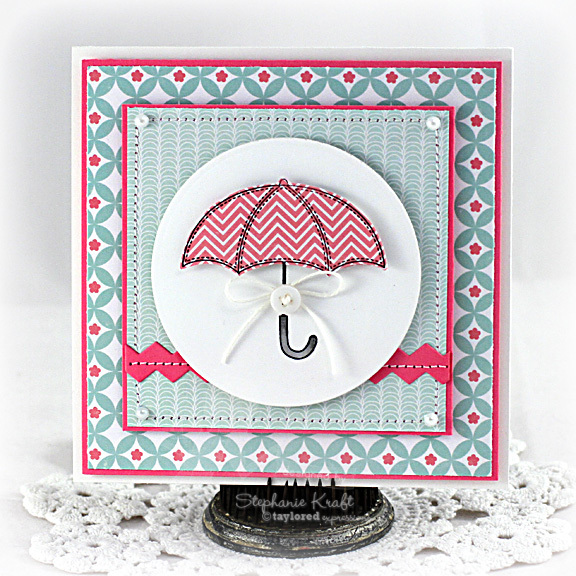 love the little umbrella and mix of patterned papers!